Inner workings of the testicles. Diagram of an adult human testicle: A.) Blood vessels; B.) Head of epididymis; C.) Efferent ductules; D.) Seminiferous tubules; E.) Parietal lamina of tunica vaginalis; F.) Visceral lamina of tunica vaginalis; G.) Cavity of tunica vaginalis; H.) Tunica albuginea; I.) Lobule of testis; J.) 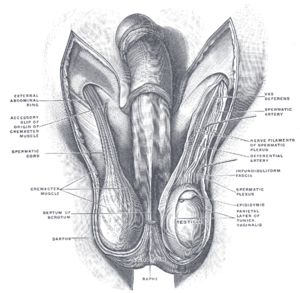 Tail of epididymis; K.) Body of epididymis; L.) Mediastinum; M.) Vas deferens.